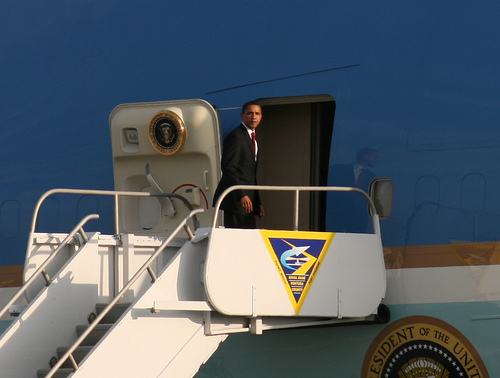 WASHINGTON, Nov 16 2012 (IPS) - Highlighting his much-ballyhooed “pivot” from the Greater Middle East to the Asia- Pacific region, Barack Obama leaves Friday for a four-day tour to Southeast Asia, including the first-ever visit by a U.S. president to Myanmar. The tour, which will be capped by his attendance at the East Asia Summit (EAS) in Cambodia, where he also expected to meet outgoing Chinese Premier Wen Jiabao, comes amid high-stakes negotiations at home with Republicans over the dreaded “fiscal cliff”, and threats that the worst violence between Israel and the Hamas government in the Gaza Strip in four years could escalate into a bigger conflict. That Obama is leaving Washington at such a critical moment testifies to the growing importance his administration is placing on its pivot – the administration prefers to call it a “re-balancing” – towards Asia, an importance also underlined by the fact that this will be his first overseas trip since his re-election Nov. 6. “His decision to travel to Asia so soon after his re-election speaks to the importance he places on the region and its centrality to so many of our national-security interests and priorities,” said Tom Donilon, Obama’s national security adviser, in a major policy address Thursday designed to set the stage for the trip. Obama’s trip, which will also take him to Thailand, caps what seemed like an almost-constant series of visits by top U.S. officials to Asia over the past several months. It includes a joint tour this past week by Secretary of State Hillary Clinton and Pentagon chief Leon Panetta to Thailand and Australia, which has agreed to host up to 2,500 U.S. Marines at one of its bases in the northern part of the country closest to the South China Sea and the strategic Straits of Malacca. Clinton, who has been intensively involved with the still-uncertain reform process driven by the unlikely couple of the president, Gen. Thein Sein (ret. ), and long-time dissident, Nobel Peace Laureate, and, most recently, elected member of parliament, Aung San Suu Kyi, in Myanmar for more than a year, will join Obama when he arrives in the region. According to the ‘Cable’ blog on foreignpolicy.com, Suu Kyi, who met the president at the White House two months ago, initially opposed Obama’s visit as premature, particularly in light of the government’s failure so far to release as many as 200 political prisoners who remain behind bars, the ongoing violence against the Muslim Rohingya minority in Rakhine State, and the failure to reach a ceasefire with the long-running Kachin ethnic insurgency. The transition in Myanmar – and the fact that Obama’s visit there will constitute a historic first – is gaining the most attention here, with some human rights groups and independent analysts arguing that Washington’s strong embrace of the process – notably his decision last July to lift the ban on U.S. investment in the country, including its controversial state oil and gas company – has been too hasty. At a rally outside the White House Thursday, Amnesty International called for Obama to stress human-rights concerns during his meetings in the Yangon with Myanmar’s leaders, who will include Thein Sein and Suu Kyi. Demonstrators said Obama, who will also be speaking to students and civil society groups at Yangon’s university, should challenge U.S. corporations to “put human rights before profits” as they invest in Myanmar’s plentiful energy and mineral resources and seek to exploit a largely untapped market of nearly 50 million people. Rights activists also stressed that Obama should take up human rights issues with his other two hosts on this trip, particularly Cambodian Prime Minister Hun Sen, whose government has long been accused of suppressing opposition parties and popular movements against corruption, and impunity for its security forces, and even Thai Prime Minister Yingluck Shinawatra. In a release issued Thursday, Human Rights Watch (HRW) expressed concerns about a lack of accountability for abuses by Thai security forces, particularly in connection with counter-insurgency efforts against Muslim separatists in the south and about the increasing use of prosecutions against individuals, including activists, journalists, and bloggers, critical of the monarchy or the government. “President Obama doesn’t need to tread lightly in discussing Thailand’s rights record,” said Brad Adams, HRW’s Asia director. In his speech Thursday, Donilon insisted that Obama will deliver a consistent message on human rights and democratic reform to all of his hosts. But he singled out Myanmar – which Washington officially refers to as Burma – for special attention. While re-affirming the progress that has already been made, Donilon said, Obama will also insist on the release of all remaining political prisoners, an end to ethnic conflicts, and access by relief workers and human rights observers to conflict areas in the country. But most of Donilon’s remarks were devoted to defending and elaborating on the administration’s “re-balancing” toward Asia and the Pacific, insisting at one point that Washington’s alliances in the region “are as strong as, or stronger than, they have ever been”. A key element of U.S. strategy, he said, was “pursuing a stable and constructive relationship with China” whose relationship, he conceded, has “elements of both co-operation and competition”. Although he noted U.S. support for Beijing’s integration into regional and global institutions, including the EAS which he said should be the main regional political forum, he also stressed Washington’s determination to “move ahead with the high-standard Trans-Pacific Partnership (TPP),” an economic initiative that has thus far excluded China. He called it “the most significant negotiation now underway in the global trading system”. China has expressed growing concern about the speed with which Washington has been upgrading its military ties with Beijing’s neighbours, some of which – including Vietnam, the Philippines, Japan, and South Korea – have clashed increasingly openly with Beijing over conflicting territorial claims in the South and East China Seas. Washington has also been conducting more joint exercises with Southeast Asian nations, including Indonesia, Thailand, Malaysia, and Singapore, as well as Vietnam, the Philippines, and increasing its access to ports in Singapore and Vietnam, as well as Australia. Even as Beijing as expanded military-to-military exchanges with Washington, some senior Chinese officials have accused the administration of pursuing a policy of “containment” and even of provoking tensions between Beijing and its neighbours. Last month, Washington invited Myanmar for the first time to observe “Cobra Gold”, the world’s largest multilateral military exercise in what U.S. officials described as a milestone in improved relations.